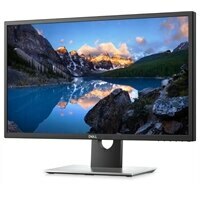 Dell UltraSharp 27 4K HDR Monitor: UP2718QRedefine realism. Create your best work: View, edit and create stunningly realistic images in HDR10. Visuals that inspire: See details no matter the luminosity or darkness with 1,000 nits peak brightness, a 20,000:1 contrast ratio and Ultra HD 4K resolution. Dell PremierColor—Exceptional for color professionals: Tackle color-critical jobs with everything you need: wide color coverage, incredible depth, precise color and customizable parameters.